A group of young people living around Rathenraw estate in Antrim have been putting the finishing touches to their recording debut for a unique music project tackling mental health issues. The project organised by Fresh Minds Education is one of 27 to have received funding as part of ARTiculate, a three-year £600,000 programme funded by the Arts Council of Northern Ireland National Lottery funds and the Public Health Agency (PHA), which uses artists and the arts to give a voice to issues affecting young people. 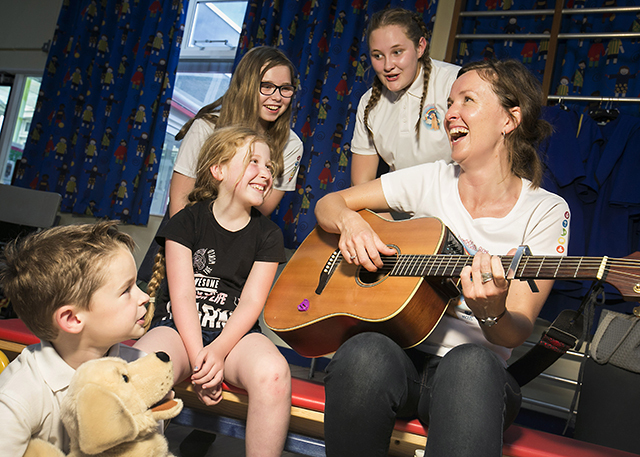 Working with professional artist Una McCann, the group attended a series of workshops to explore emotional health themes through music and song writing. Involving young people from primary and secondary schools, the project was spearheaded by seventeen 12-18 year olds who worked with the younger children to draw out the emotions which affect them most, including feeling angry, sad, anxious, worried or low. By taking a creative approach, the group was able to explore the feelings and learn the AMBER approach, which is a structure that supports children to develop coping mechanisms in a safe and relaxed environment. To mark the end of their project, Red Box Media visited the group to record some of the music they have been working on. “This is the first time that this group of teenagers have been engaged in an arts based mental health programme. Over the past two months we have watched their confidence grow and their real selves shine. “The positive links between engagement in the arts and wellbeing are firmly established. Working together with the Public Health Agency, the Arts Council is supporting a diverse range of projects right across Northern Ireland that open up opportunities for young people to engage in the arts and the many benefits that brings, such as promoting self-expression, and developing self-confidence and self-motivation. The ARTiculate programme was launched in January 2017. The programme will run over three years and it is anticipated that approximately 35 projects will be supported as a result of the funding. The programme is delivered by artists and arts organisations working in partnership with youth and community organisations linked to the PHA across a range of health improvement themes.